George Nelson is considered one of the most influential figures in American design during the second half of the twentieth century. Operating from the western side of Michigan as Design Director at the Zeeland-based furniture manufacturer Herman Miller for more than twenty years, Nelson had his sights firmly focused on Cranbrook, which was also playing a defining role in the development of Modernism. Organized by the Vitra Design Museum in Germany, George Nelson: Architect/ Writer/ Designer Teacher is the first comprehensive retrospective of Nelson’s work. It has been touring in Europe and most recently in the United States at the Bellevue Art Museum in Seattle. Cranbrook is the final stop in the US tour and the last opportunity to see this major exhibition before the work returns to Germany. More than 120 three-dimensional objects including examples of chairs, benches, desks, cabinets, lamps, and clocks, as well as over 50 historical documents, such as drawings, photographs, architectural models, and films, form the core of the exhibition. Nelson was responsible for the production of numerous furnishings and interior designs that became modern classics, including the Coconut Chair (1956), the Marshmallow Sofa (1956), the Ball Clock (1947), the Bubble Lamps (1952 onwards). 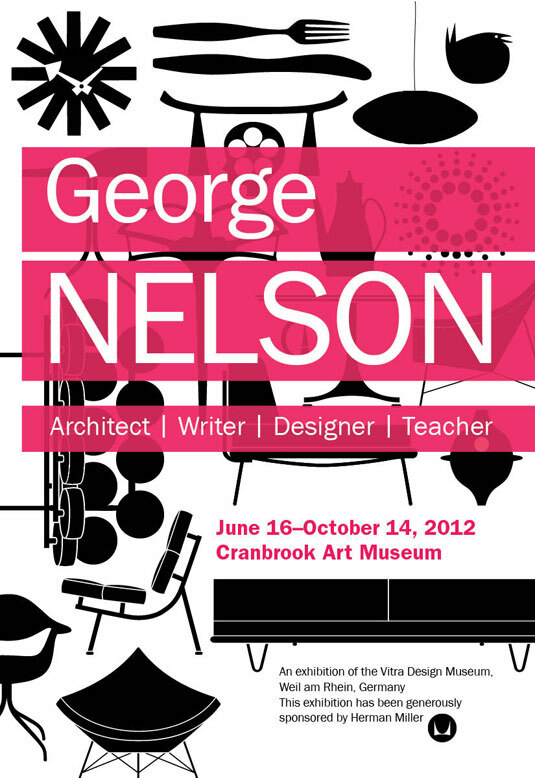 George Nelson: Architect, Writer, Designer, Teacher is an exhibition of the Vitra Design Museum, Weil am Rhein, Germany. The American tour of the exhibition has been generously sponsored by Herman Miller. Herman Miller also is the presenting sponsor of the exhibition at Cranbrook Art Museum. Additional support for the exhibition at Cranbrook is provided by the Alden B. Dow Home & Studio. Promotion of the exhibition is supported by an award from the Michigan Council for Arts and Cultural Affairs and the National Endowment for the Arts.